[James] doesn’t need a circuit board or even some protoboard to get the job done. He free-formed all the circuits for his VFD clock. Right now this is the only project hosted on his blog so click around to see how he got to this point. Here’s a scratch-build traffic light which [Jarle] uses to display information about his server. If you’re unable to find your own storm damaged original this is a pretty easy way to build one. This game is running on an FPGA, but it’s not written in HDL. Instead, [Johan] wrote the game in C to run on a soft processor loaded on the gate array. This is a fascinating idea for generating random numbers. [Gijs] is shining a laser onto a light dependent transistor. The beam of the laser is broken by the falling sand of an hourglass. This technique could be use as an entropy source for random number generation. It seems like massive overkill, but you can’t beat the time accuracy of using a GPS module as a clock source. We don’t expect that [Jay] kept the clock in one piece after finishing the project. It’s just a good way to practice decoding the GPS data. [Michael Mitchell] put together a demonstration of how Google Talk can be used to communicate with scripts. Although the concept isn’t new we haven’t seen very many projects that use the chat interface for issuing commands and receiving data. The one that does come to mind is this home automation project which uses Google Talk because it’s quite a bit faster than SMS or email communications. The team over at Waterloo Labs reasserts their reputation for creativity with this real life Mario Kart project. One of the team members must work at Austin’s Park because they seem to have had free rein when it comes to modifying the go-karts and filming the delightful video presentation found after the break. It’s one thing to put on some costumes and head off to the go-kart track. It’s another to modify the vehicles to react to items launched by another rider. You can see the painted PVC launcher hardware to the right of each driver. By stuffing a plush item (banana, star, mushroom, etc.) in the barrel the driver can use compressed air to launch it quite a distance. Inside of each item is an RFID tag. When the RFID reader on a kart detects the tag it can take control of the steering, brake pedal, or speed limiter to inflict the appropriate actions. If you don’t have this kind of insider access to your local go-kart track don’t fret. You just need to build your own set of karts. This breadboarded circuit uses a PIC chip to control the Raspberry Pi’s power supply. We first noticed this gap in the RPi features when we built an XBMC setup around the RPi board. It’s not the end of the world, but since installing the Raspberry Pi we have been unplugging it after each use. [Kevin Sangeelee’s] circuit could be the path to automating this process. This is not really aimed at media applications. The PIC circuit does switch power to the RPi, but the goal was to add a push-button to do so. Other goals of the project include scheduled shutdown and data logging of brownout events on the power rail. As you can see, there’s a coin cell in the mix which keeps time when the system is in power down. 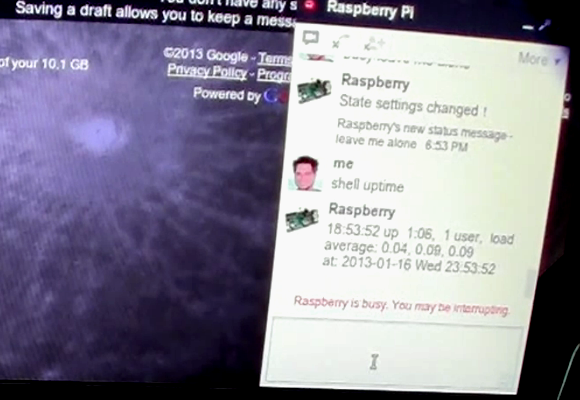 The RPi communicates with the PIC via i2c. This facilitates full power-down using the Linux command ‘shudown -h’, as well as the ability to schedule a restart time. Adding an IR receiver and tweaking the PIC code are all it would take to trigger the power controller from the couch. This lamp which [Dablondeemu] built will add a little whimsy to your home decor. The project started as coursework for a Digital Art and Installations class. But the remote controlled color changing cloud ended up being a pretty neat gift for her little brother. The prototype uses an Arduino, breadboard, and a collection of LEDs to perform its tasks. [Dablondeemu] admits the next revision should have a standalone circuit board. The electronics are housed in a clear plastic container which was then adorned with Polyfill stuffing which would commonly be found inside a decorative pillow. The polyester fibers do a great job or filtering and diffusing the light. But they don’t seem to interfere with the incoming IR signals from the remote control. If you like the idea of creatively shaped diffusers you should take a look at this giant LED lamp. It’s molded to look like a through-hole package with the leads hiding the power cord. Cycling power meters can set you back quite a pretty penny. [Keith] quotes prices starting at $1500 and going up to $4000. We know several serious cyclists who would think twice about spending that on a bike, and wouldn’t even consider putting that kind of investment into an accessory for it. But if you’ve got the time [Keith] will show you how to build and install your own cycling power meter. The link above is a roundup of all the posts and videos [Keith] made along the way. We’ve embedded his introduction video after the break where he discusses the goals of the project. The system allows for independently measuring the power of each leg. This is accomplished using strain gauges on the cranks to monitor torque. This data is combined with cadence measurements (how fast the rider is turning the cranks) which is all that is necessary to calculate the power output of the rider. The parts list comes in at about $350. This doesn’t include the equipment he used to test and calibrate his calculations. Although it’s technically possible to get 16 bits of resolution on a ATMega328, most implementations of PWM on everyone’s favorite ‘mega – including just about every Arduino sketch – are limited to 8 bit PWM. This means the pins can only output 256 different values, so if you’re playing around with music made on an Arduino don’t expect very high fidelity. There is a clever way around this: use two PWMs, and use one pin for high bytes and another for low bytes. That’s what Open Music Labs did when working on a synthesizer project that needed very high quality audio. The basic idea behind the build is that PWM pins can be used to create audio frequencies. Using two PWM pins and adding them together means it’s possible to add extra bits of resolution. This requires using different values of resistors on each pin. For example, using the same value of resistors on two PWM pins increases the resolution by one bit. 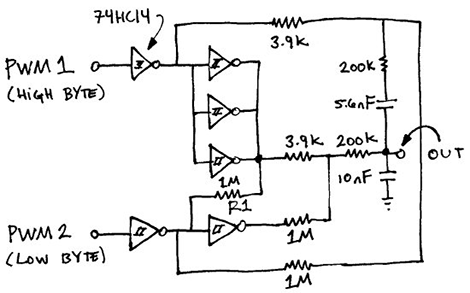 Two pins with a resistor value ratio of 1:4 increases the resolution by four bits, and so on. There’s a great tutorial for setting up these higher resolution, dual PWM outputs on an ATMega or Arduino, as well as a distortion analysis for this dual PWM setup.